Ben Huh may be the CEO of the humor-oriented Cheezburger Network, a business built on funny cat pictures and other web ephemera, but for more than a year now he has been thinking night and day about the future of the news industry — and not the future of newspapers and other traditional models, but what the news industry might look like if they didn’t exist. That’s because Huh and his partner Matt Galligan have been building a new, mobile-only news app called Circa, which has been in beta testing for some time and finally launched this morning. The app is more than just an attempt to rethink the way that traditional news is delivered or consumed: Huh and Galligan want to rethink how it is constructed, on an almost molecular level, and adapt that for an age that is becoming increasingly mobile and time-constrained. Part of the thinking behind Circa comes from ideas that have been described by author and journalism professor Jeff Jarvis, as well as media-startup veteran David Cohn, who is also a founding partner of Circa and acts as its editor-in-chief. The main idea is that the traditional article or story format that newspapers and other news outlets have produced for so many years no longer fits with the way we produce or consume information now. The standard “inverted pyramid”-style article was designed for the days when people might only see one report about a news event, printed on dead trees and without links, so it had to include virtually everything. Now, however, the news has become more of a process than an artifact, with multiple reports from different sources, updates, social links and other elements added over time. But news-reading formats remain more or less the same as they have always been. So part of Circa’s mission, Galligan says, was to rethink not just the way that traditional news is delivered for mobile or digital audiences, but to rethink the way that news is produced as well — and that meant trying to boil down the idea of a news story into its component pieces. So Circa doesn’t show you an entire news article, the way a mobile news app from the New York Times or some other traditional outlet would: instead, it breaks the news down into its “atomic units,” which consist of a series of news facts, background information and other elements (photos, quotes, etc.) A user can then choose how many of those atomic units to read at a given time. So in looking at a news event like the vice-presidential debate, for example, Circa began with a short paragraph about the stakes for the respective candidates, with much of the emphasis on the Obama campaign to make up for the allegedly lacklustre performance of the president in the previous presidential debate. If that’s all you wanted to know, the brief would be enough — but scrolling down in the app produces other points, each of which is a short paragraph or two that adds more in the way of background to the story, a quote to highlight the issues, and so on. 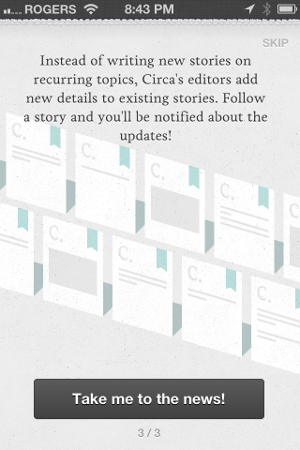 The points are written by Circa’s editors, and the sources for each are included at the end of each item. I have only just started playing with Circa, so it’s hard to say whether this kind of atomic-level news consumption will become mainstream, or whether most people are happy enough consuming traditional news articles through mobile platforms like Flipboard or through newer aggregators like Prismatic (which Galligan says he is a big fan and user of). And if the idea of Circa is to allow people to quickly scan short news briefs, what is the business model? On that topic, Galligan says the company is thinking about advertising, but also about the back-end production platform that Circa has built, which other news entities or content producers might be interested in. There’s one thing to be said for Circa, however: unlike most of the existing news-reading apps from both traditional media players and newer entities like Flipboard or Zite, it shows some of the most advanced thinking about not just the delivery of news but the way news stories are constructed, and that is refreshing. It’s ironic — and somewhat fitting — that it comes from a man like Huh, who has been regularly scoffed at for his theories about journalism. Finally, somebody is thinking about news differently. When will traditional media get it. Ad agencies could help them. If only they’d let us. Finally, people are starting to think differently about how news is, and can be, consumed. Ad agencies can certainly help the traditional media make the transition… if only they’d let us. This would lend itself well to charging for news on a granular level – lead text might be free, imagery or video would be a small charge, updates or longer article might cost a bit more. Lead you through a story with a series of micropayments based on your engagement. 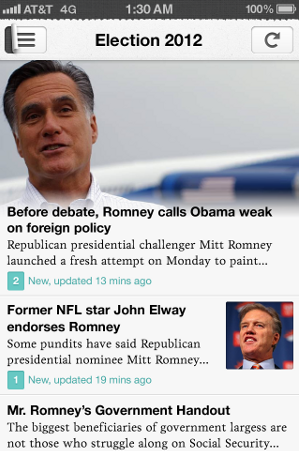 This is a really fantastic way of browsing the news on your phone. You can tell that they put in a lot of effort into figuring out how long each portion should be in an attempt to make a smooth reading experience. It looks ready to build out it’s content into wider topics, but would it get better if it was full service? Or is it better as a “top stories” destination? Well, the app took a couple of minutes to load and then crashed. Not a good stat in my book. Well, it is a startup. Maybe we should cut them some slack? This has a chance if it is built well, on solid journalism principles, yet constructed with the kind of granularity that is no one is doing at this point in time. If you can walk the fine line of bite informing with transparent article tracking and a high quality push/link notification system, then you may build something people would use. And the Key will be usability!